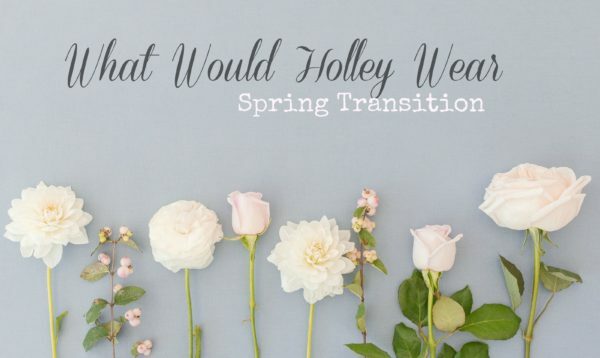 How does your style transition from winter to spring? In Texas, our spring weather can be cool/cold one day and warm/hot the next. The good news is, pastels and bright spring colors make for an easy transition. So it’s springtime and 50 degrees outside. No problem…just top off your white jeans with a pastel coat. A pretty spring transition style on our Pinterest board is a pastel blue coat worn over a black and white striped sweater and white jeans. 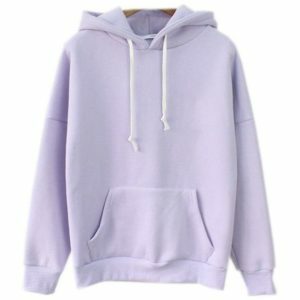 And a pastel lavender hoodie is one of my new springtime favs. BTW….hoodies are perfect for seasonal transitioning. My favorite spring coat is a pastel pink coat. 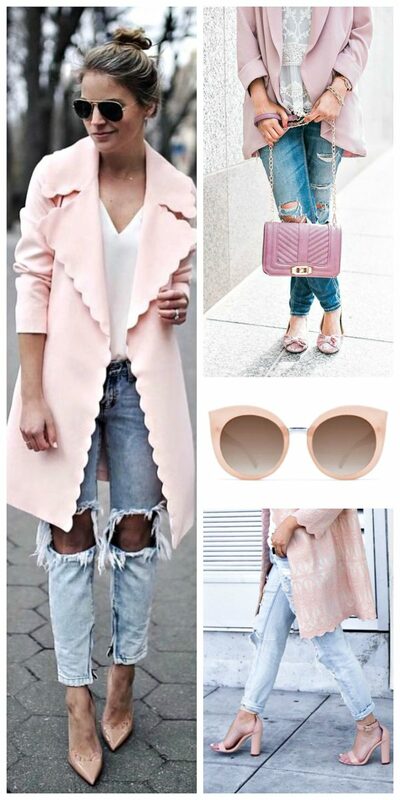 A look on our Pinterest board that I plan to copy is a pastel pink coat, light blue jeans, a white lace top, and a pink bag. And we are loving the pastel pink trench vest paired with a striped sweater, jeans, and pearls…of course! Also, I have to mention the pink embroidered scalloped coat….beautiful! They show it with light blue jeans, a white blouse, and pink sandals. 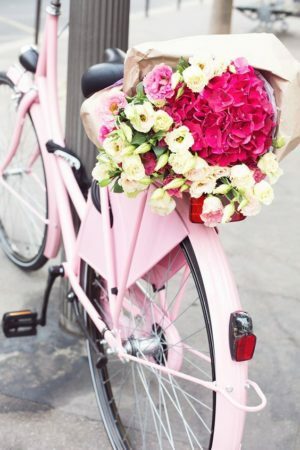 Looks like “pretty in pink” is perfect for seasonal transitioning! A pastel Tiffany blue is another great springtime color, and when worn with white jeans and a white blouse, it definitely says goodbye to the winter blues. We are also loving the short Tiffany blue jacket paired with light pink jeans on our board. Another great way to add this pretty pastel color to an ensemble is with a scarf. Plus, the word’s out…Tiffany blue looks great on everyone! Uh oh, today’s spring weather forecast is cloudy with a chance of snow flurries. Ok, maybe not in Texas but somewhere….right? Looks like you will need a pair of boots in a pretty springtime hue. So why not consider wearing a pair of blue Hunter or UGG boots with a monogramed hoodie and black workout pants. A bright blue jacket can double for athleisure wear and will be perfect on the slopes! 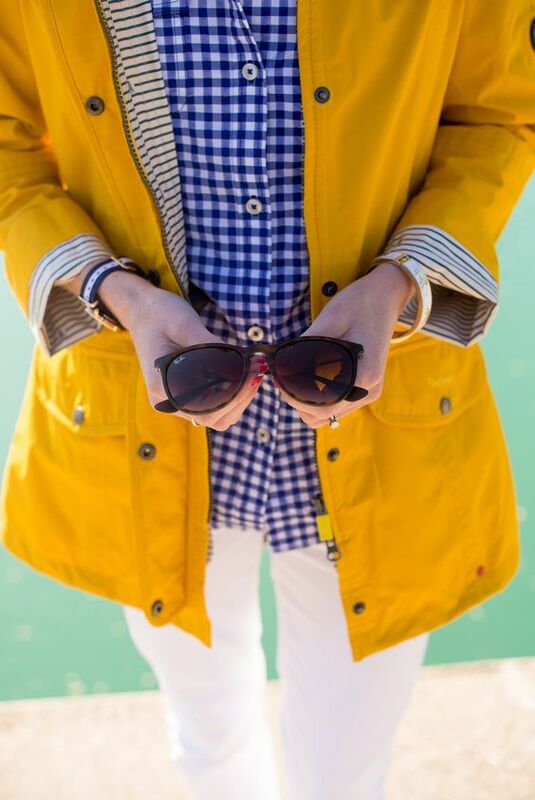 For me, the best remedy for a rainy spring day is a bright yellow jacket. Think about wearing it over a blue-checked shirt and with white jeans. A great rainy day look on our board is a yellow rain jacket worn with dark blue jeans, red Hunter boots, and a multi-colored umbrella. This combo will have you seeing rainbows! When it’s still cool out, think about layering a navy and white striped sweater over a chambray shirt…just add your yellow coat and rain boots! 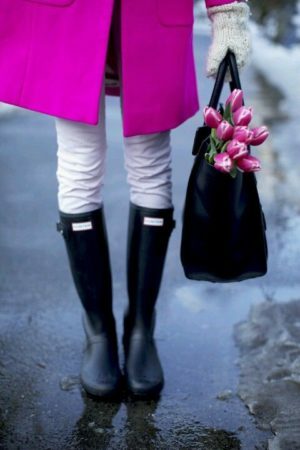 One of our board features is a hot pink coat shown with white jeans, and black rain boots. For a fun element, they added a bag full of pink tulips! Be sure to take a look at all the fun and colorful rain boots on our Pinterest board. From florals to polka-dots, get ready to make a big splash this spring! Two of my favorite colors are pink and red, and when you combine the two…color blocking never looked so pretty. I’m loving a red pencil skirt paired with a pink blouse with dramatic sleeves. And what about the pink t-shirt shown with a red and white striped skirt and red statement necklace on our board? 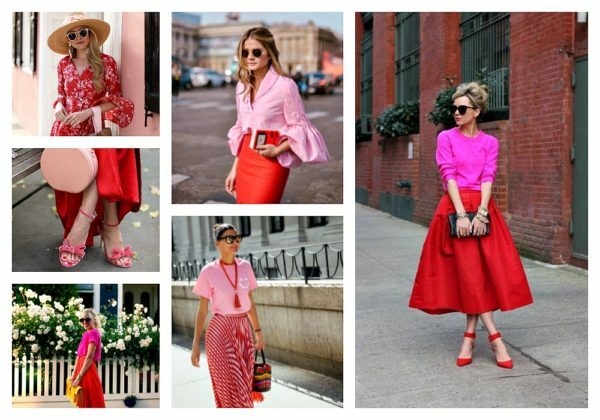 Wow…who knew there were so many ways to pair pink and red? From pastels to bright colors and from rainy days to sunshine…transitioning your wardrobe will surely add a “spring in your step”!